AMATOR, PETER, and LOUIS, St. Amator, a priest; St. Peter, a monk; and St. Louis, a layman; who were martyred in 855 by Moors in Cordoba for encouraging their fellow-Christians to keep the Faith no matter how severe the tortures they faced were. CYNWL, (Sixth Century), St. Cynwl was the brother of St. Deiniol (11th September), the first Bishop of Bangor, and lived an ascetic life in northern Wales. After his repose several churches were dedicated in his honour. DESIDERATUS, a priest and anchorite in Gourdon 35 km/22 mi south-west of Chalon-sur-Saône in present-day Burgundy, France. St. Desideratus reposed circa 569. 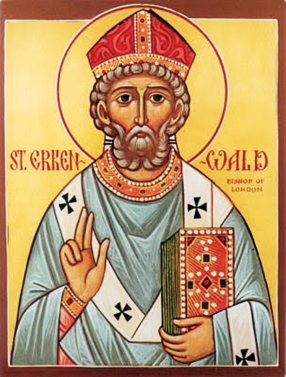 ERCONWALD (ERKENWALD), (Seventh Century), an East Anglian Prince who renounced the world and used his fortune to build two monasteries, one at Barking, which he placed under the direction of his sister St. Ethelburgh (11th October), and the other at Chertsey where he served as the first Abbot. In 675 St. Theodore of Canterbury (19th September) consecrated him Bishop of London. Governing that See for the remaining eleven years of his life, St. Erconwald proved to be an able and pious prelate. He reposed in 686 and his tomb in Old St. Paul’s became a centre of veneration, famous for miracles. EUTROPIUS, consecrated a bishop and sent to evangelise the area of Aquitaine centred around Saintes. St. Eutropius served as the first Bishop of Saintes, and is said to have been martyred circa 250. Many sources state he was consecrated by Pope St. Clement I (23rd November) who reposed in either 99 or 101. He is also said to have been a companion of St. Dionysius of Paris (9th October) who reposed in either 250, 258, or 270. Obviously as there is over a century between the dates St. Clement and St. Dionysius flourished, both theories cannot be correct. FORANNAN, an Irish monk, and later Bishop of either Domhnach-Mor or Armagh. St. Forannan left Ireland settling at present-day Waulsort, Belgium. There he either joined the newly founded Waulsort Abbey or was one of the founders. In 962, St. Forannan became Abbot of Waulsort. He reposed in 982. 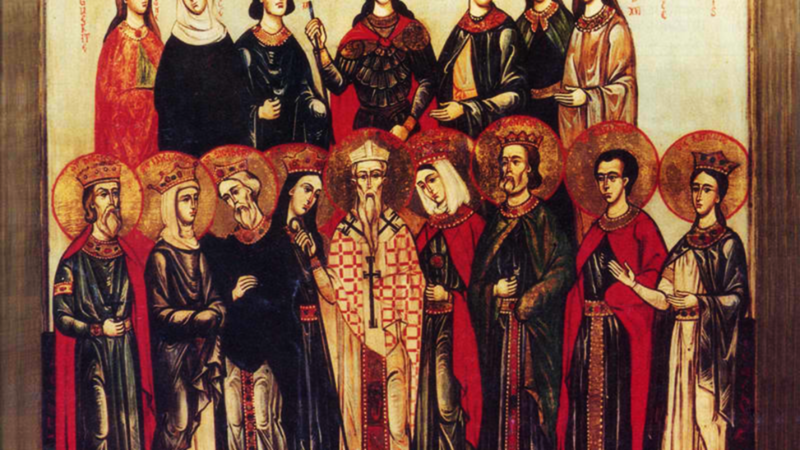 JAMES, MARIANUS, and COMPANIONS, St. James, a Deacon; St. Marianus, a Reader; along with a group numbering in the hundreds, were martyred at Cirta in Numidia (present-day Constantine, Algeria) in 259, during the Valerian persecutions. LAURENCE of NOVARA and COMPANIONS, a friend and assistant of St. Gaudentius (22nd January), Bishop of Novara, in Piedmont. St. Laurence was martyred circa 397, along with a group of children he was catechising. POMPONIUS, consecrated the twenty-second Bishop of Naples in 508, serving until his repose in 536. St. Pomponius ardent defender of orthodoxy against Arianism. SOPHIA, a maiden in Fermo in present-day Italy, martyred circa 250 during the Decian Persecution. SWITHBERT the YOUNGER, originally from England, St. Swithbert went to Germany where he is believed to have spent time working with English missionaries. Later he was consecrated Bishop of Werden in Westphalia. St. Swithbert reposed in 807.